Ryan Simard works on his FIRST LEGO League team's robot Monday before heading to the FLL World Festival in Atlanta. The Milford-based team is the only LEGO team representing New Hampshire. MILFORD - David Schunemann has no aspirations of making the football squad or hitting the game-winning home run. The Hollis home-school student is not bashful about his passion for research, robotics and all things LEGO. 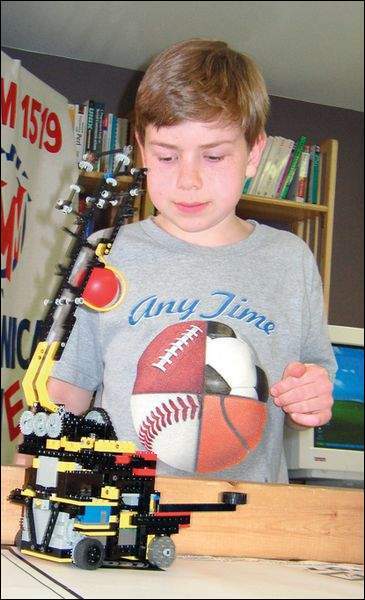 He is a member of Mindstorms Mayhem, a FIRST LEGO League team based in Milford and composed of 10 home-school students from the area. Schunemann even plays the role of lead vocalist for the team’s song, sung to the tune of the “SpongeBob SquarePants” theme. The team of 9- to 14-year-olds is in its third year and has already experienced quite a bit of success. Members of the team are hoping for more at this weekend’s FLL World Festival in Atlanta. Last year, the team competed in the festival and took home the director’s award, one of the top honors. After last year’s success, the team received more then $10,000 in grants from LEGO and BAE Systems and helped start up teams at Milford Christian Academy and Milford Middle School. In December, the team repeated as state champs and has been spending the past few months preparing for this weekend. Monday evening, the team held its final practice before departing today. The team met in its usual practice facility, the basement of Charlotte and Bill Gray’s Milford home. The room is a LEGO lover’s dream, with dozens of LEGO pieces of all shapes and sizes spread out across a table. On a shelf in the back of the room are the team’s trophies, made out of LEGOs, of course. The theme of this year’s competition is “No Limits.” The team’s robot is supposed to complete tasks a disabled person might encounter, recreated to a smaller scale on a playing field. Several times, the team tried to complete its routine on a practice table, but the robot would occasionally move in the wrong direction. Chris Jennings, one of the team’s mentors, kept the team’s spirits up, saying it’s good to work out the kinks sooner than later. ”It's better to get all the bugs out now before we go,” Jennings said. Jennings, 17, used to be a member of the team. The positive experience he had as a member was the reason he came back as a mentor. Siblings Nicholas and Katie Hammes are both in their first year on the team and said they have learned a lot about computer programming. Katie also helped with designing the team’s T-shirts. Melissa Gray has been on the team since its inception. She said it provides girls with an opportunity to learn more about engineering, a field dominated by men. Team member Nathan Streeter said the concept of teamwork plays a significant role in the team accomplishing its tasks. “We all work for the same goal and we all have a lot in common,” Streeter said. Mindstorms Mayhem is the only LEGO team from the state going to Atlanta. The team will spend most of today traveling and will compete on Thursday and Friday. There will be 75 teams from 20 different countries. For its research portion of the presentation, the group visited nine local public libraries to determine whether the accessibility for disabled people was adequate. They also visited the Massachusetts Institute of Technology, Tufts University and the National Braille Press in Boston. Paul Lacroix, a volunteer for the Nashua Public Library, met with the students and was impressed with their concern for handicapped individuals having access to the building. “They asked a lot of questions,” he said. The students encouraged Lacroix to train the library staff on how to use JAWS and MAGic, two programs that help blind or visually impaired patrons use the library. Nancy Streeter, Nathan’s mother, chuckled when asked how significant a time commitment volunteering for the team is. The team meets two or three times a week for much of the year. “It does require a lot of time, but it’s worth it. The kids love it,” Streeter said. The team will be judged on robotics, its research and its ability to work together. “These kids have learned problem solving, engineering skills, teamwork and public speaking skills. It’s a great program. These next few days are going to be hectic though,” Bill Gray said. Considering how well the team performed last year, the question remains how the team will manage to outdo itself in Atlanta. “Only to do it again,” Charlotte Gray said with a laugh. Michael Brindley can be reached at 594-6426 or brindleym@telegraph-nh.com.